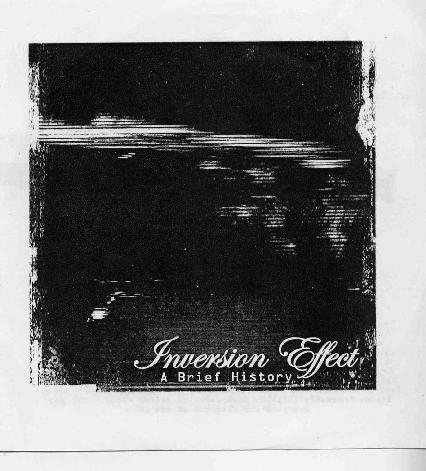 Inversion Effect is a collaboration of musicians attached to the Artificial Music Machine label, bringing together Martin McCreadie (Limiter), on guitar and synth, Dan Burton (Afreet) on bass and synth, and Thomas Fang (Static Storm System) on field recordings, turntables, scanner frequencies and a range of other noises. The eleven tracks are selected from three years of studio sessions, rehearsals and live recordings, including the band’s original score for the silent vampire movie “Nosferatu”. Opening the album is “Fnordic Track”, featuring monotonal synths from the depths of space. This segues into “Cavesong (Planetarium Version)“ a nine-minute piece with guitar feedback and percussive chimes that take their cue from Tangerine Dream’s “Electronic Meditation”. The short “A Static Transmission” is different again, whirling spheres bringing to mind Popul’s Vuh’s “Affenstunde” album from the 1970 dawn of ambient, or even Bill Bruford’s “The Shepherd Is Eternal”. Despite the near absence of conventional musical structure on “A Brief History”, some tracks do contain elements of musicality. For example “A Wife’s Hope” has a chord sequence of sorts, and “Faces In The Hall” has a gentle synth riff and glissando guitar before fading in percussive chimes in what could almost be a remix of Peter Bauman’s “Haunted Heights”. “In The Shadow Of The Vampire” even features strings and congas, while “777” (neighbour of the Beast?) has programmed percussion, with more sparse piano and guitar atmospherics, making it the most accessible piece on the album. Overall, the music is less challenging and dark than labelmates “Numbers On The Mast” with whom Inversion Effect have recently toured, making it a more user-friendly introduction to the Artificial Music Machine sound. Devotees of early krautrock and ambient sounds will find plenty to enjoy on this album.